The Thursday Birders is a dedicated, inquisitive, jovial, and friendly group of birdwatchers that is affiliated with the Central New Mexico Audubon Society in Albuquerque, New Mexico. As the name implies, the Thursday Birders, which is open to anyone interested in birds regardless of their experience, embark on field trips on Thursdays throughout the year. Exceptions to this every-Thursday schedule are some holidays and the annual Festival of the Cranes at Bosque del Apache National Wildlife Refuge south of Socorro, New Mexico. This group of birders—and their field trips to nearby and far-flung destinations within New Mexico—began in 1988 and has continued to the present. During its 30-plus years, the group has amassed an impressive list of 302 bird species that have been identified on its field trips. It also has contributed several thousand dollars to nature-related organizations in New Mexico through the voluntary $1-per-trip contribution of participants. The annual Birdathon, in which participants record every species of bird they see in a 24-hour period and they and others pledge to donate a certain amount per species, also raises funds for nature-related projects or organizations. Thursday Birders come from all walks of life, involving people with interesting and varied backgrounds, including a superb collection of experienced birders and folks who are just beginning their journey into the satisfying world of birdwatching. Each Thursday brings a different destination, a different trip leader, a different set of birds, and the same delightful sense of camaraderie and the sharing of bird-related and other information. The Thursday Birders has evolved from a dedicated group that consisted mostly of women to a vibrant collection of people whose primary interest is birds but whose other interests are as diverse as the individuals who gather together each week. For the first eight years, Tami Bulow led Thursday Birders field trips and the group collectively decided where to go on the next week’s outing. Following Tami’s dedicated effort, Julie Gooding and Madge Wallen assumed responsibility for leading trips and deciding on each week’s destination during the years 1996-1998. In 1998 and continuing into 2004, Mary Lou Arthur began planning trips two to three weeks in advance, leading many of the trips herself and asking others to lead trips as well. In 2004, Rebecca Gracey began planning trips three months at a time, emailing locations and the names of trip leaders to more than 100 people in the group. Rebecca, who continues to schedule trips and arrange leaders, and 10-11 other birders would lead the trips for the next 10 years. 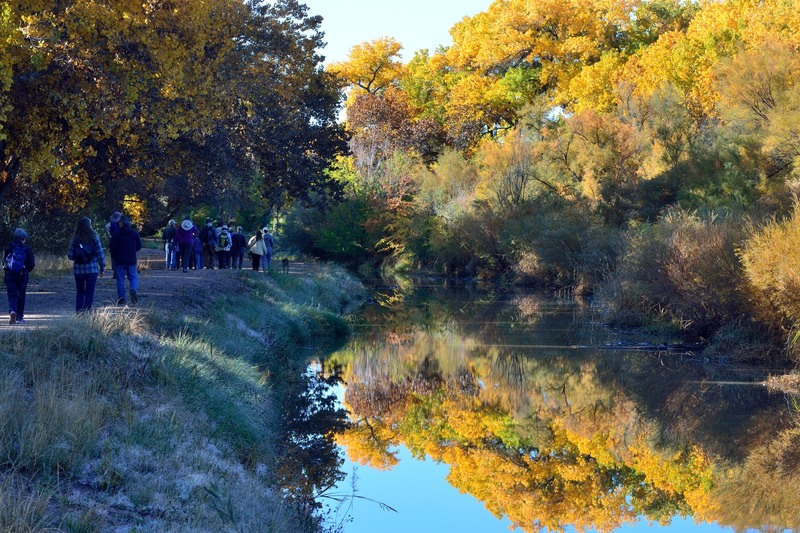 In 2014, the field trip information was posted on the Central New Mexico Audubon Society’s website, ending the email list and opening the Thursday Birders to locals and visitors to New Mexico. Nowadays, upwards of 35 people attend the weekly field trips and continue to enjoy identifying birds and socializing with other members of the group. You are welcome to join the Thursday Birders as your schedule allows. If you have participated in the group and have an interesting story to share, please contact Lefty Arnold at wanderingtattlerja@yahoo.com. Back to the Trips schedule page.